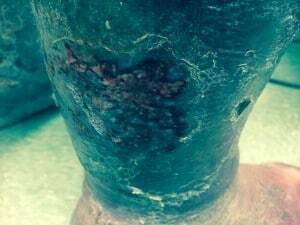 Who needs Diabetic Foot Care? The answer is, anyone with Diabetes should have a yearly diabetic foot exam to check for Diabetic Neuropathy and prevent foot infections. Diabetes is a serious metabolic disease in which the body does not produce or properly use insulin, which causes high blood sugar levels. This is toxic to the bodies smallest blood vessels- to the eyes, the kidneys, and to the nerves of the feet. That is why in addition to yearly diabetic foot exams, they should also have their eyes and kidneys tested! It afflicts about 16 million Americans and can cause very serious long-term complications, including kidney damage, cardiovascular disease, nerve damage, eye damage, osteoporosis, and foot damage. Our main goal is to prevent foot infections leading to amputations; your Podiatrist will first ask many questions about your blood sugar. Then she will visually inspect the skin of the foot for any open areas, cracks between the toes or on the heels, and the condition of your skin (too damp or too dry) Areas of redness and blisters are attended to. Different treatment protocols are recommended for each condition. Then Dr Teimouri will check your pulses in your feet to see if you have adequate blood supply to heal any wounds. Next the neurological exam uses a very specific thickness of nylon bristle to check the nerves in your foot and determine if protective sensation is intact. This determines if you have DIABETIC NEUROPATHY, which is serious , but can be managed by your podiatrist. Last she will check for any bony deformities that put you at risk for pressure sores that can open the skin and become infected. The elevated blood sugar levels found in diabetics can negatively affect blood circulation in all parts of the body. This is especially true of the feet, since they’re the furthest away from the heart. One of the unfortunate results of this poor circulation is nerve damage. This is known as diabetic neuropathy. · a painful, burning sensation. · loss of sensation, which can progress to a total lack of feeling in one or both feet. As a result of diabetic neuropathy, many diabetics literally cannot feel their feet. They can be completely unaware when they’ve injured their feet, particularly if the injury is minor. The following scenario is typical. First, a diabetic develops a blister or other minor irritation from footwear that doesn’t fit properly. They then fail to realize that this has happened, and continue to make this minor injury worse. Finally, the wound becomes infected. Due to the poor blood flow common among diabetics this infection can easily become an ulcer. Needless to say, proper foot protection is critical for patients with diabetic neuropathy. Part of this protection are specially made diabetic shoes and socks. Why are diabetic socks so important? It’s simple. Diabetic socks keep diabetic feet dry and reduce friction. Many also function like compression stocking, preventing blood from trickling back down the legs and pooling. There are many different makes, lengths and styles, so there’s sure to be a pair that fits your exact needs. · Seamless construction. Most diabetic socks are constructed without seams. This helps prevent friction injuries such as blisters. · Breathability. Good diabetic socks allow as much air as possible to circulate around the feet and toes. · Moisture control. The material used to make diabetic socks keep your feet dry by wicking moisture away from the skin. · Square box toe construction. Diabetic socks are designed without narrow tips. This helps prevent excessive moisture from building up between the toes. · Extra warmth. Diabetes negatively affects circulation, which can lead to cold feet. Most diabetic socks are constructed with fabric which offers a high degree of insulation. · Padding. High quality diabetic socks often have extra padding to cushion and protect the feet. · Proper fitting. Diabetic socks are designed to conform to the foot. This prevents them from being too loose or too tight, which reduces friction. Many diabetic patients suffer from both impaired arterial blood flow and vein-related swelling. A recent study published in the Journal of Diabetes Science and Technology has examined this problem in light of diabetic compression socks. The results further confirmed that socks providing mild-moderate compression were able to reduce edema (swelling) while not negatively affecting blood flow to the feet. Selecting the right socks can be quite a balancing act, yet can present a win-win solution if done properly. If this describes your situation don’t just guess—seek the help of a podiatrist before buying your diabetic socks. Finding a sock that suits your individual needs is often as simple as asking your podiatrist for a recommendation. Especially if you’re a patient with diabetic neuropathy, this is a conversation that’s definitely worth having. Even if you have diabetes, you may be lucky enough, or manage your condition well enough, to avoid neuropathy. If this is the case, simply choose a pair that feels comfortable but still provides a mild-moderate level of compression. Choose any length that fits your needs. Those with neuropathy should talk with their doctors, especially if the condition is getting worse. Most of these individuals also have long-standing vein problems which may require stronger compression. 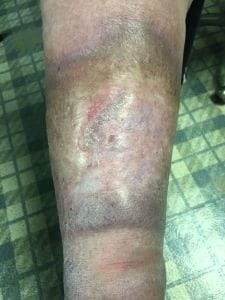 These patients also commonly experience very dry, cracked skin. In this case spending a little extra money to buy socks made of higher quality, softer material is a good investment. If you’re a diabetic with neuropathy who has lost feeling in their feet then several other features are likely to help. It’s very important that your socks fit properly and don’t become creased or bunched up, so fitted socks are best. Similarly, socks constructed without seams also reduce the risk of friction injuries. The reasoning is simple. If you can’t feel your feet, it’s possible to have no idea that you’re damaging them with every step. Finally, if you’re a patient with advanced diabetic neuropathy speak with your podiatrist about the precise level of compression you’ll need. It’s important that they fit just right, providing as much compression as possible without cutting off circulation to the feet. Also towards this end, avoid socks made with tight elastic bands at the top. Dr Teimouri DPM never gives up on her patients! Type 1: Adults with this type of diabetes (sometimes know as insulin-dependent) cannot make their own insulin, so they must take it every day to live. Type 2: People with this, the most common type of diabetes, may have to take insulin or pills so that their body can use insulin more effectively. Type 2 diabetes is connected to family history, age, and obesity, among other things. Gestational diabetes: This type is experienced by women in the later stages of pregnancy. It usually disappears after a woman has given birth, but about 50 of women who experience gestational diabetes will then develop Type 2 diabetes in as few as five years. Because of reduced blood flow or nerve damage in the feet, individuals with diabetes are prone to many complications, including foot infections. If left untreated, these infections—some of which begin as just cuts or blisters—could lead to potentially serious consequences, including foot, toe or even leg amputation. The good news is that you can often manage your diabetes to prevent or minimize most diabetic foot problems, reducing the risk of limb loss. Since diabetes affects different parts of the body, most diabetics must see several medical specialists for proper disease management. Beaver Valley Foot Clinic’s doctors will work with you to develop an individualized, easy-to-follow plan to help keep your feet healthy. Call 878-313-3338 today! “Because I am a diabetic, about four years ago, I wanted to improve my health, so I began attending a Zumba class 3-4 times a week. I was able to easily do the moves, even lots of jumping, and I felt no pain; mostly because of diabetic neuropathy. I didn’t realize I could not feel a lot of damage that that was occurring. The impact of the workouts was breaking down the bones in my feet. My arch areas was collapsing. I didn’t realize this was a problem until I realized there were lumps on the bottoms of my feet.My legs and feet started to swell, so I got an appointment with my primary doctor who sent me to the ER to check for blood clots!. There were no DVT clots so he put me on water pills to take down the swelling, completely disregarding lumps on the bottom of my feet! Worse yet, I was just getting ready to go on vacation, and ended up spending most of it lying in bed, as I was in excruciating pain.Eventually, my left foot started bleeding; but it wasn’t until I went to see Dr. Tina that my condition was recognized as Charcot Foot. By then, my bones had formed a hard mass on the bottoms of my feet, which meant that I had been walking on bone, and, of course, the complications were only getting worse. In fact, as I discovered, the correct diagnosis came just in time, because, without the proper treatment, I could have lost my foot. It really scares me to think that, for four years, I was putting my trust in a doctor who repeatedly told me that my symptoms were being caused by veins in my legs that had been weakened by my diabetes, and had never even heard of Charcot Foot! “My problem began as a foot blister on the ball of my right foot; and I really didn’t think much about it until it started bleeding. Eventually, it got infected and began leaking fluid, so I went to my primary doctor, who put me on antibiotics, which didn’t help. In the meantime, as the owner of a pizza shop, I still had to work 14 to 15 hours a day, spending most of that time on my feet. So, at one point, I decided to try drying my feet by putting them up by an electric heater; but, because my diabetes has affected the nerves in my feet, I couldn’t feel how hot it was, and I ended up with burns and blisters on my toes. “I have a condition called Venous Insufficiency, which prevents blood from getting to the veins, causing tissue to break down, and leading to ulcers and sores, which, because of the poor circulation, heal so slowly that, at times, I’ve had them last for six months. Dr. Tina has been treating me for these ulcers for awhile; but, many times, while the wounds appeared to be healing on the surface, they didn’t go away completely. But, because she never gives up on searching for newer, better treatments, she’s now using a medication that, besides greatly accelerating the healing process for my wound, has healed it thoroughly. So, this has improved my life tremendously; but, more than just the process and the medication, it’s Dr. Teimouri herself. A lot of doctors come into the room, get some information, treat you, and that’s it; but with her, it’s like talking to a friend. In fact, it’s almost like your next door neighbor is dropping by to see how you are, but then she treats you, too! She’s immensely caring and compassionate. 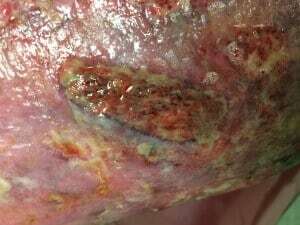 ““I had an ulcer on each foot, and for a year-and-a-half, I was being treated at the Wound Care Center at Ohio Valley Hospital, where I went every week for debridement of the wounds. Because it was considered outpatient surgery, they would bill my insurance thousands of dollars; and I ended up being billed for $200-$300 every week, though I wasn’t getting any better. Then one day, while visiting a client whom Dr. Teimouri had operated on to straighten out some toes, I was surprised to see her up and around so soon after the procedure, as I’d been told that if I had foot surgery, I’d be laid up for months. Grade 0 a pre- or postulcerative site. 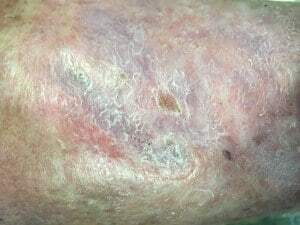 Grade 1 ulcers are superficial wounds through either the epidermis or the epidermis and dermis, but that do not penetrate to tendon, capsule, or bone. Grade 2 wounds penetrate to tendon or capsule, but the bone and joints are not involved. Grade 3 wounds penetrate to bone or into a joint.